First!!! Please support this site by clicking here!. Thanks a lot for your support. ^_^ Arigatou gozaimasu! Hanabishi Recca- Recca is a descendent of the Hokage (Hoa-kah-gay) Ninja Flame masters. In other words, he has the ability to shoot fire from his right hand. The arm band on his right arm protects him and prevents the great flame inside of him from eating him alive. When Recca was a baby, he was sent 400 years into the future by his mother in order to protect him from the bloodshed and slaughtering of the Hokage Ninjas in that era. In the future world, he meets Sakoshita Yanagi, a girl who goes to his school and is about his age, and swears to be her ninja, saying that she is his Hime (Princess). For a reason unknown to him, he has a great obsession with ninjas and has always wanted to be one. This obsession has led him to learn many of the ninja's fighting techniques, giving him the ability of a great fighter. His fighting motto has always been, "If you defeat me, I will be happy to be your ninja" (which has gotten him into a bit of trouble....). Sakoshita Yanagi- Yanagi has a strong love for children and works at a day care center (I think). She was working with children when Recca first saw her, and it was this fated first meeting where he saved her life pushing her out from under falling pipes only to be seriously injured himself. In turn, Yanagi used her special healing power to heal his wounds, and a relationship soon blossomed. ^_^ Because of this unusual and special power of Yanagi's, Mori Kouran wants to do tests on her to see if perhaps she is the key to the Hokage Ninja's 400 year old immortal technique. Overall, Yanagi is a sweet and cheerful girl and serves the purpose of the stereotypical "Damsel in Distress", aka Recca no Hime (Recca's Princess). Kirisawa Fuko- Fuko is an old friend of Recca's since childhood. They have been fighting since forever because she has always wanted the title of Princess so Recca could be her ninja. Of course, she was really really pissed to find out Yanagi had gotten the title first and was even more dismayed to discover that Recca hadn't become Yanagi's ninja b/c she defeated him. Instead, he had become her ninja b/c he WANTED to. Because of this jealousy, Kage Houshi was able to convince Fuko to take the Elemental item, Fujin, the God of Wind, so that she could defeat Recca. 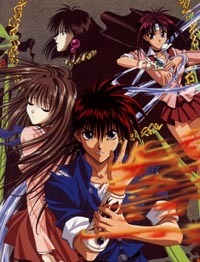 In the process of fighting Recca with the wind, the Fujin took her over (becuase she was not strong enough to control it), and her powers grew to the extent of creating a tornado which would have killed her if Recca and Domon had not found a way to interfere.... Fuko, overall, is a tomboy with an attitude, but her ability to fight with her throwing knives and her behavior is what makes her admirable..
Mikagami Tokiya- Tokiya is a year older than Recca, Fuko and Domon. His sister (who has an uncanny resemblence to Yanagi), was killed by Kurei's men 7 years ago over the elemental item, Ensui, which is a sword made of water. Ever since, Tokiya has lived only for revenge. He is manipulated by Kage Houshi into thinking Recca is affiliated with those who killed his sister, and therefore ends up fighting Recca. At the end of the fight, Tokiya makes Recca promise to always protect Yanagi, or else he will cut Recca in half... Tokiya overall is very cold and reluctant to help Recca and his friends. Koganei Kaoru- Once one of the elemental masters with Kurei, Kaoru loves strong people and a good fight. He is only in junior high but has mastered his elemental item, Kougan Anki, which has five sides. Overall, Kaoru is not a bad person, but loves to tease others, esp. Recca. Kurei- A flame master like Recca who also came from 400 years ago. He gave Recca the scar on his face and has the ability to control an angel of flame which he can summon, Kuranei. Mori Kouran- Kurei's father.. he wants the power of eternal life, and thinks Yanagi may be the key. In the public world, he has the appearance of a generous contributor to good causes. Nagai Mokuren- He is one of the evil elemental masters who can control plants which grow from his body. He is also a mad scientist and enjoys killing and torturing women. Katashiro Reiran- Reiran is a doll girl who controls marionettes. She is accompanied by her small doll, "Primela". Sekioh- He was a murderer with a 200 year long prison sentence, but Kurei released him because he wanted him as his personal bodyguard. He is also an elemental master who controls stone. Kage Houshi- Recca's real mother who has been cursed to be immortal because she used the Hokage Ninja's Time Manipulation technique to send Recca into the future. At first she appears evil because she manipulates Recca's friends to attack him, but this is only so that he may become stronger. Marikawa Ganko- Ganko (name meaning stubborn and pig-headed) is the elemental master that controlled Reiran, the doll girl. Once she was defeated, she admitted to the Recca-gumi that she worked for Kurei b/c she had lost her mother a year ago, and, one day, seeing a doll in a department store window that looked like her mother, she was entranced. Kurei used the elemental item to bring the doll to life, and in exchange, made Ganko promise to work for him. Afterwards, Ganko joins up with Recca and his friends. Tatesako Fumio- Recca's history teacher who knows a lot about the Hokage Ninja and lives in a temple. He is kidnapped by Kurei's people because he is a loose end that might possibly expose the Hokage ninjas. Ohka- Recca's true father from the past.